Beware of Fake Access Control Panels? Do you need to worry about fake access control panels? A recent advertisement by Mercrury Security, one of the largest access control panel manufacturers, raises this concern. This follows the ongoing legal battle between them and access control heavyweight Lenel Systems. In this note, we examine the ad campaign and what link exists between it and the lawsuit. "For over 20 years, Mercury Security has perfected the hardware platform of choice for some of the best names in the industry. Reliable, flexible, and open, Mercury allows for a wide range of configuration options and deployment of almost any software solution." 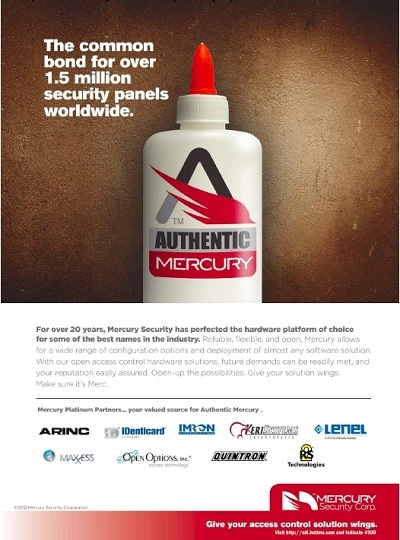 Mercury provides only hardware to their OEM partners, which is managed by the partner's access management software. Mercury is one of the few manufacturers in the access industry manufacturering panels compatible with third-party management software. This structure is not common, as it is with IP cameras and VMS in the surveillance industry, with most manufacturers offering (and supporting only) proprietary hardware.Mercury's partners include Lenel, Honeywell, Maxxess, Open Options, RS2, and others. Though their largest OEM partner, in 2011 Mercury filed suit against Lenel, claiming multiple counts of copyright infringement. This lawsuit stems from Lenel's release of a "Universal" line of hardware, which utilizes the Mercury protocol, though may operate only with Lenel software. Mercury claims agreements in place did not allow this, while Lenel claims otherwise. The suit is still in progress, with the nuances of the Mercury/Lenel agreement currently being debated. Mercury does allow use of the Mercury protocol in third-party products via their "Mercury Powered" program, currently in use by Assa Abloy, Keri, and others. "The authenticity of our platform was born in the 90’s and marked as Authentic Mercury in 2011 when the introduction of other access hardware was promoted as a functionally equivalent alternative. While some believe imitation is flattering, we think it can lead to confusion. To be certain no one is confused we created the Authentic Mercury mark. It is the brand to look for when are specifying, buying or installing and you want the best in open access architecture. Make sure its Merc." Considering Lenel introduced their Universal line of controllers, the offending products in the Mercury v. Lenel lawsuit, in 2011, the Authentic Mercury label was clearly influenced by this. This marketing move is likely a preventative measure, as well, to deter future infringements by partners or others, a statement that Mercury intends to protect its brand.